This article describes the main functionality of User Management - one of the features used for Workspaces. If you are not using Workspaces to manage multiple Targetprocess instances, you can still manage your users via default People list or any view where User is selected as cards. Workspace is basically a separate Targetprocess application, with its own database and therefore separate settings, processes and views. However, unlike a regular Targetprocess account, Workspaces can have shared users and easier navigation between these instances. Workspaces functionality is currently still in beta, and is not available by default. You can request beta access via our support. Here you can see all the users and which workspaces they have access to along with their default role and last login date, which can be useful to see if you can deactivate users who do not use Targetprocess and save a license. 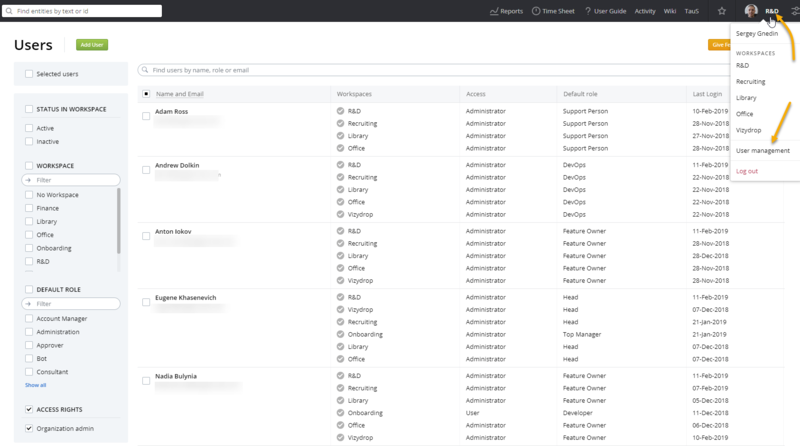 On the left part you see can filter by active/inactive status, workspaces, default role and access rights (see Organization Admins section below). “Selected Users” in filters section can be useful if you wish to display several users that would otherwise be found in different pages or filter conditions. Naturally, you can add users in User Management page. Please note that users require a license only after they are assigned to a particular workspace, so you can create users beforehand at no cost. User Management for Workspaces introduces a new level of permissions to handle access to whole organization containing multiple Targetprocess instances - Organization Admins. 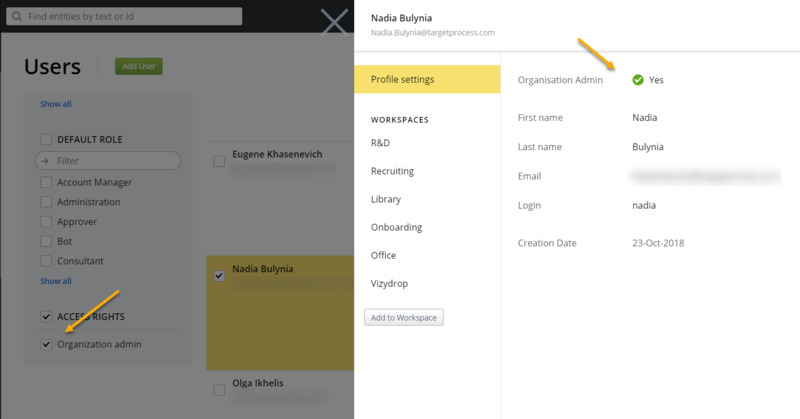 Organization Admins can edit any user and add them to any workspace you have. ANY user can be Organization Admin, they don’t have to be administrators or even have edit user permissions in Targetprocess, so please be careful when enabling this property. Who can access User Management? Users that have administrator permissions in at least one of the Targetprocess instances. In this case they see all users and Workspaces, but can add, edit and remove only people in workspaces they have access to.